Frictional Games is famous for its immersive, atmospheric first-person games; games created by a small team working closely together. For our next game, we need to expand that team! We need a gameplay coder who can support the rest of us, taking on responsibility for game-wide systems such as inventory, AI, first-person body, and other features that the player’s experience will depend on. Join us, and help us transport our players to strange and terrifying new realms. The position is full-time, and project-based for the period of 1 year. After that period there may be a possibility for the position to become permanent. What will you work on? It is a big plus if you have already worked on most of these before. While we value experience, it is more important that you are willing and able to dig into challenges and learn new things. We are interested in playing to your strengths, so the things listed will not be the only ones you will be working on. The person we’re looking for should have a solid understanding of different gameplay systems. You need to be able to see the big picture and have a firm grasp on how information flows between modules, and how complex behaviour can be reduced into simple rule sets. We use our own engines, so you need to be able to adapt to the existing system and code base. We also value the end user experience, so we hope you can step into the players’ shoes instead of only focusing on the nitty gritty technical stuff. You have to be a European resident to apply! You have worked on a game that uses 3D environments. Well-versed in C++, C#, Java or similar. Major role in completing at least one game. Strong self-drive and ability to organise your own work. A critical approach to your work, ability to reflect. Confidence in implementing your own designs. A Windows PC that runs recent games (such as SOMA) that you can use for work (unless you live in Malmö and will work from the office). A fast and stable internet connection. For this position you can work from home. We have a central hub in Malmö, Sweden, which you can use if you wish. Flexible working hours, a no-crunch approach. Opportunities to influence your work flow. Variety in your work tasks, and ability to influence your work load. Participation in Show & Tell of games, having a say in all aspects of the game making. An office in central Malmö you can use. A possibility to become a permanent employee. Did the tasks above sound like your cup of tea (or other beverage)? Are you the person we’re looking for? Then we would love you hear from you! The last day to send the application is 8th of July 2018 - but the sooner the better. Tell us why we should hire YOU! Please note that we require all the attachments to consider you. 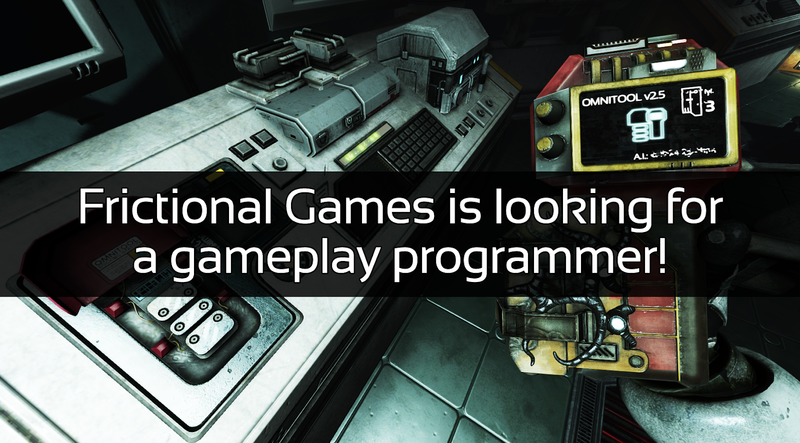 Send your application to apply@frictionalgames.com! By sending us your application, you give us permission to store your personal information and attachments. Seriously, it's 9th June 2018. Announce the new game already. Guess it still needs to be built. The radiosilence is a bit weird though especially considering the eyetrack thing they have been working on for SOMA. I hope that it didnt cost you much time because I am not replaying SOMA a third time if that was the hint you guys were going for. Almost 5 years is enough for a loving community to start getting anxious, although i know for sure that no matter how long it takes, the wait will be well worth it. That does not help for now though.. The eye tracking project was actually done by one person in less than a month, and has not affected the development of the two new games!